Once our 100% wool yarn arrives from Yorkshire, the entire process takes place at our workshop in rural Somerset; from design room to loom. 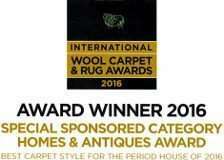 We are exceptionally proud of the workmanship that goes into our carpets; all are woven on our own looms, hand checked and finished by our team of skilled craftspeople to ensure the highest quality from start to finish. The ethical and sustainable aspects of running our business are important to us, we want to be as proud of that aspect of our products as the designs and making. These are the practices we have in place at the moment and we are always looking for ways to improve further. Wool is a naturally renewable and biodegradable material. It is also naturally stain resistant and fire resistant reducing the need for additional chemicals. We buy our electricity from a supplier with 100% renewable sources. The polythene we use for wrapping the carpets is made from 50% recycled plastic. The ready-made rugs are made from the remnants of orders which stops them going to waste, and the waste yarn is collected by volunteers and used to knit blankets for refugees and is also wound into balls and sold to raise money for various charities. We also give the wool away to local craft groups. Everybody who works for us is paid above the Living Wage Foundation recommended wage. 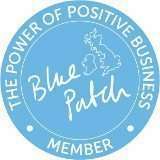 We are members of Blue Patch, an organisation devoted to promoting ethical, sustainable producers across the UK, encouraging people to make positive choices when shopping.